Puntos Necesarios: 3800 Tenga en cuenta que, de momento, no se puede descargar contenido de nuestra plataforma directamente en un dispositivo móvil (teléfono, iPod, iPad, tabletas ...). Necesitas descargar sus artículos en un PC o Mac y, a continuación, transferirlos a su dispositivo de forma normal. Estamos trabajando para permitir que las descargas directas a los dispositivos móviles, pero esto no es posible en la versión actual de la plataforma. Perdón por las molestias! NOTICE: Requires the base game Cities in Motion 2 in order to play. Activation key must be used on a valid Steam account. 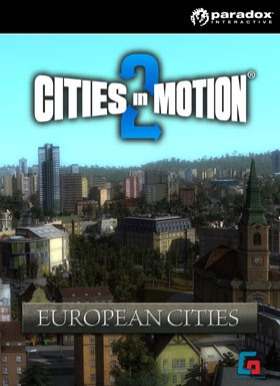 Requires internet connection.ABOUT THE GAMEEuropean Cities brings a multitude of new buildings to Cities in Motion 2. European style architecture lets you play in a new setting with an old world feeling. A campaign inspired by interesting European cities leads you on an adventu… re tackling the transportation troubles in cities reminiscent of Liverpool, Prague and Düsseldorf. So hop on and get inspired by Europe!Inspired by LiverpoolThe city inspired by Liverpool in United Kingdom takes you to the coastline and its exciting riverside. How can you use the water areas to your advantage? Find out and let the significant tourism flourish! Besides catering vast opportunities to your waterlines, the city is known for innovations, particularly in terms of transportation. Show what you can do with it!Excited about DüsseldorfThe international business and financial centre in Düsseldorf, Germany, is known for fabulous office buildings and financial institutions. Major companies have their headquarters by the beautiful river which meanders through the city. Düsseldorf is the main inspiration to this modern city. Find out if you can create a network that even the most critical business people appreciate! Influenced by PragueOver 1000 years old city of Prague, the capital of Czech Republic, is one of the largest in Europe. It is a cultural centre which has gone through good and rough times during its history. Prague, that has one of the highest rates of public transportation in the world, was our choice to inspire the biggest city of these 3 maps. Are you ready to take on the challenge?KEY FEATURES New campaign with 6 scenarios (6 to 10 hours gameplay) 3 new maps inspired by European cities: Liverpool, Düsseldorf and Prague (34) New buildings to bring that European feel to your gameSYSTEM REQUIREMENTS Windows : Operating system: Microsoft Windows XP/Vista/7/8 Processor: 2 GHz Dual core Memory: 3 GB RAM Video: nVIDIA GeForce 8800, 512 MB RAM or ATI Radeon HD 3850, 512 MB RAM DirectX®: 9 or aboveMac : Operating system: OSX Snow Leopard 10.6.3 Processor: 2 GHz Dual core Memory: 3 GB RAM Video: nVIDIA GeForce 8800, 512 MB RAM or ATI Radeon HD 3850, 512 MB RAM Linux : Operating system: Ubuntu 12.04 LTS Processor: Intel Core Duo Processor (2GHz or better) Memory: 3 GB RAM Video: nVIDIA GeForce 8800, 512 MB RAM or ATI Radeon HD 3850, 512 MB RAM Additional: GLSL 1.3, OpenGL 2.1. Paradox Interactive, CITIES IN MOTION® Copyright©  Paradox Interactive AB All rights reserved.